The United States and South Korea on Saturday started joint naval exercises that will involve three U.S. aircraft carriers in what military officials describe as a clear warning to North Korea. The four-day drills that began in waters off South Korea’s eastern coast come as President Donald Trump continues a visit to Asia that has been dominated by discussions over the North Korean nuclear threat. The battle groups of the USS Ronald Reagan, the Theodore Roosevelt and the Nimitz will successively enter the exercise area during the drills that run until Tuesday, South Korea’s Joint Chiefs of Staff said. 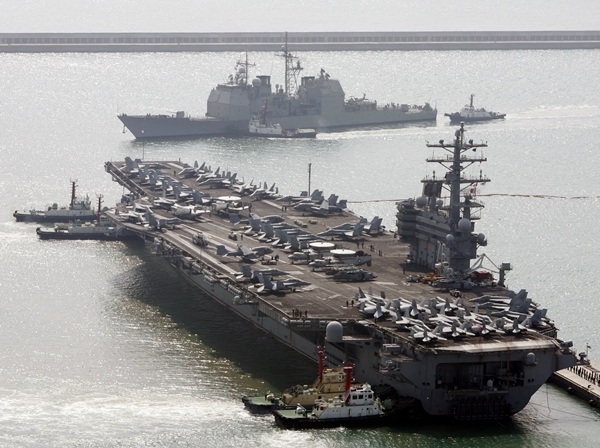 The three carriers will be likely together in the drills around Monday, according to a South Korean military official, who didn’t want to be named, citing office rules. The exercises will also involve 11 U.S. Aegis ships and seven South Korean naval vessels, including two Aegis ships. The Aegis technology refers to missile tracking and guidance. They will aim to enhance combined operation and aerial strike capabilities and also display “strong will and firm military readiness to defeat any provocation by North Korea with dominant force in the event of crisis,” Seoul’s military said in a statement. It’s the first time since a 2007 exercise near Guam that three U.S. carrier strike groups are operating together in the Western Pacific, according to the U.S. Navy’s 7th Fleet. The U.S. carriers will also participate in separate exercises with three Japanese destroyers on Sunday, according to Japan’s Maritime Self-Defense Force. The United States has been sending its strategic assets, also including long-range bombers, to the region more frequently for patrols or drills amid accelerating North Korean efforts to expand its nuclear weapons program. In recent months, North Korea has tested intercontinental ballistic missiles that could reach the U.S. mainland with further development and has conducted its most powerful nuclear test. It also flew two new midrange missiles over Japan and threatened to launch them toward Guam, a U.S. Pacific territory and military hub. Trump continued his tough talk against Pyongyang on Friday in a speech to business leaders at the Asia-Pacific Economic Cooperation summit in Danang, Vietnam, saying that the region’s future “must not be held hostage to a dictator’s twisted fantasies of violent conquest and nuclear blackmail,” referring to North Korean leader Kim Jong Un.